There were many questions heading into this Monster Energy NASCAR Cup Series Folds of Honor QuikTrip 500 race weekend. The majority of those centered around the first look at part of NASCAR's new handling/horsepower package for the Cup cars. 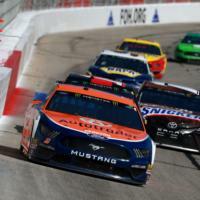 The predictions varied about some idiosyncrasies with drafting, but by Sunday morning, there seemed to be a common coda in the garage: restarts really matter and the long runs would look like the same Atlanta Motor Speedway races from the past. Those prophecies were spot on. If the NASCAR media corps took a shot for every time we uttered the word "package" Friday, we would be as drunk as we are sugar-buzzed in the QuikTrip-laden media center. The rules package for the Monster Energy NASCAR Cup Series is a radical departure from what the series has been running. At tracks greater than a mile, Cup cars are running a higher spoiler (to create more drag), a bigger front splitter (for more downforce), and engines with a greater tapered spacer (to choke horsepower down 200 counts to 550). This is all in hopes of keeping the pack closer together on race day, hopefully creating more meaningful passes for position. Sure, people complained about the type of racing NASCAR drivers delivered through most of Speedweeks. The single-file, follow-the-leader parades that were the Advanced Auto Parts Clash, the Gander RV Duels, and the Xfinity Series race were boring and even some drivers didn't understand why more of their brethren weren't taking chances passing on the low line. And then there was the bloodbath of a Gander Outdoors Truck Series race that saw only nine of 32 entries finish. 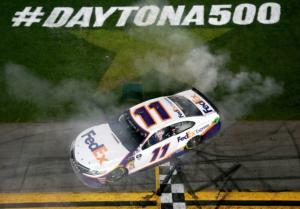 And a litany of late-race wrecks made the last ten laps last an hour in Sunday's Daytona 500. But the Great American Race delivered a show on levels many weren't expecting. On a morning that started in the high 20s in Metro Atlanta, Atlanta Motor Speedway officials had to sigh. There would be no ticket voucher "Good Weather Guarantee" for the free Folds of Honor QuikTrip 500 Pit Party in Norcross. But that worry subsided when fans showed up in force an hour before the 10 a.m. kickoff time Saturday. The wait is over. Chase Elliott has won his first-career Monster Energy NASCAR Cup Series race. 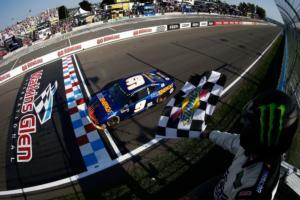 He held off 2017 MENCS champion Martin Truex Jr. in a thrilling finish in the Go Bowling at the Glen at Watkins Glen Sunday. His win came in his 99th career start, just over halfway thru his third full-time season with powerhouse Hendrick Motorsports. That may not be exactly the fairytale Elliott imagined when he dreamt of becoming a Cup star like his father. But both William Clyde Elliott's, son and father, had to suffer some near-misses before their Victory Lane kisses. 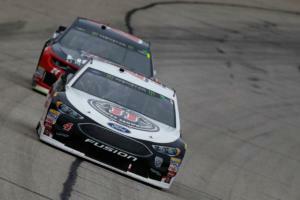 The biggest story in the Monster Energy NASCAR Cup Series this season has been the absolute beatings that Kevin Harvick and Kyle Busch, with a taste of Martin Truex Jr., have laid on the field. Roush Fenway Racing and Matt Kenseth grabbed the news cycle by the horns this week, announcing that the champion driver will return to the organization that brought him into the Monster Energy NASCAR Cup Series. Kenseth will drive an unspecified number of races in the team's No. 6 Ford Fusion, splitting time with Trevor Bayne. Wyndham Hotels and Resorts will sponsor Kenseth in at least some races. Bayne will continue to run the races sponsored by Advocare. Atlanta Motor Speedway is almost every driver's favorite track. You hear that every time NASCAR's circus pitches tents in Hampton, Georgia. Drivers love the 21-year old surface at the legendary 58-year old track because it causes tire wear and forces drivers to search all over for grip. Old pavement puts the race back in the drivers' hands and every driver I spoke to - from young William Byron to Sunday's race-winner and longest-tenured Cup driver Kevin Harvick - say it's fun. 22-year-old Chase Elliott is driving the No. 9 car in 2018 and the retiring Dale Earnhardt Jr. had a lot to do with it. 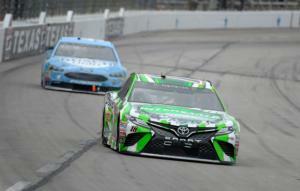 On a sunny, windy Monday, Atlanta Motor Speedway went green with even greener drivers making their first 2018 laps. Xfinity Series rookies Christopher Bell and Tyler Reddick and Camping World Truck Series yellow-striper Dalton Sargeant had more on the line than just learning a new track with new vehicles. They began the synergy with their new teams and in different ways.